In which I take a shower of boiling antifreeze and keep my equanimity. Last Friday I took my friends Lou (not that one) and Jean to the Honolulu airport around 4:00 PM in heavy rush-our traffic, stop and go, more stop than go, mostly stop and little go Jenny Wuebbe, daughter of Hollow Skai was also with us and the the two of us were going to a workshop at Yoga Hawaii on kindness and me presenting my new installation there. Now, my 91 VW Vanagon has a very slow leak in the cooling system, which I hadn’t topped off for a little while. These old vans don’t like stop and go in the Hawaii sun and after we had turned around and were on the H1 freeway, looking at some more heavy traffic at least for a few more miles the car started to overheat, just as I had made it to the far left lane. We made it back to the right and off the freeway at the next exit and quickly onto the sidewalk of Vineyard Blvd. There was a good boil going on in the back. After what I thought was hopefully enough time, I had to go to the bathroom really badly, I started to unscrew the cap of the cooling system to replace some water, when the cap just blew off and I tool a shower of boiling antifreeze. It was a full body shower including head, face, mouth shirt and pants. Fortunately I only received a light burn on my right forearm, but the taste in my mouth was far from pleasant. So what is yoga? Most of us understand yoga as the physical exercise done in pastel colored tights on rubber mats were we aim for flexibility and the ability to touch our toes. In a recent article on yoga the German news magazine describes in more or less detail 18 styles of yoga from Acro Yoga, Ashtanga Yoga, Iyengar Yoga, Power Yoga, to Vinyasa Flow and Yin Yoga. The majority of the different styles deal primarily or exclusively with the physical aspect of yoga, which traditionally is called Asana = Posture. In the introduction to the Bhhagavad Gita translated and introduced by Eknath Easwaran, Easwarran describes the Gita as brahmavidyam yogashastra, a textbook on the supreme science of yoga and suggests that there are as many meanings as there are paths to self-realization. The four main strands of yoga according to the Gita are jnana yoga, the yoga of knowledge, bhakti yoga, the yoga of devotion, karma yoga, the yoga of self-less action and raja yoga, the yoga of meditation. The word yoga, comes from the word yuij or yoke, to bind together, it is the unity of life experienced, pure consciousness or the sum of what one must do to realize the Self (Easwaran). Other definitions of yoga in the Gita are evenness of mind and skill in action, integration of the spirit. A yogi is a person who is accomplished in yoga. It goes beyond this writing to explain all the different limbs in detail, but I like to emphasize two things, one that the last three limbs of yoga deal with the practice and affect of meditation, since what is meditation really other than concentration, the ability being to focus on one thing for an extended period of time until we are able to unify with the Self, Atman, the divine core of personality, which ultimately is the same as Brahman, the Godhead or ultimate reality. The second point I like to make is that Asana (posture) means two things, the place on which the yogi sits and the manner in which he sits (Patanjali). Traditionally the most famous asana is the lotus pose, sitting cross- legged. The modern yoga as we mostly encounter it then really is Asana, just one limb of yoga. There are complex reasons, why this single limb of yoga has become the predominant practice in the Western world and what we commonly understand as yoga. From my own experience after 30 plus years of meditation practice I know how difficult it is for us westerners, who are used to sit in chairs to sit quietly with crossed legs and try to focus our minds. Only recently have I made some new progress and it is thanks to diligent daily practice of pranayama, asanas and sitting meditation and some observance of the Yama’s and Niyama’s. I cannot claim to have practiced Pratyahara or that I have reached Samadhi. I like to put the idea forward that one of the reasons we need to practice Asanas, to be healthier of course, but that we in our bodies are actually able to sit in concentration for a while. Our Western lifestyles, especially sitting in chairs with backs, not moving enough, diet, etc has lead to a disconnect from our bodies, weak backs, stiff necks and stooping shoulders, weak core and total weakness of the connection, between lower and upper bodies. Most all of us know one or most of these maladies. For five years I have practiced every day, missing less than a handful days per year, and know how the practice of yoga and an Ayurvedic inspired lifestyle has changed me. It is from experiencing the daily change that I can write this, and that I can experience a shower of boiling antifreeze without yelling and cursing. 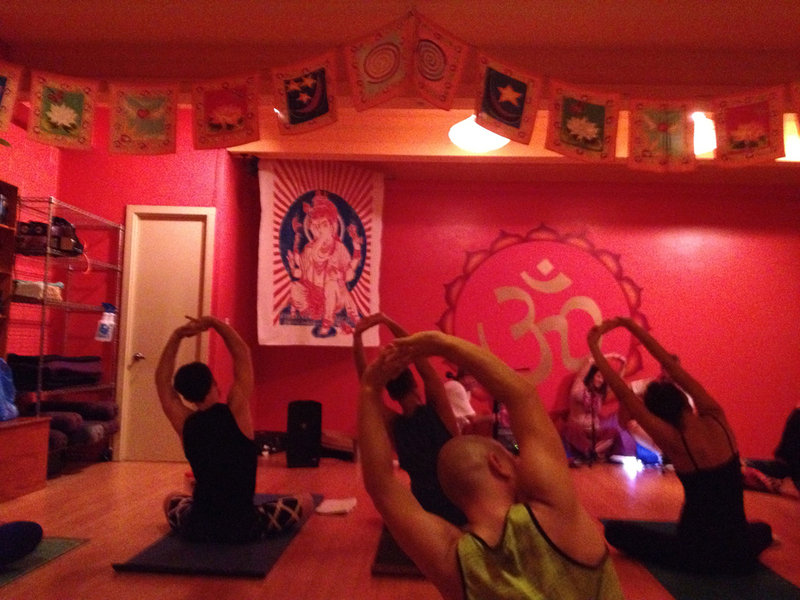 Thanks for sharing this story, nice description of yoga and your experience, Dieter. Great catching up with you yesterday. Well, I was just speaking with a friend about kayaking from shore to a barrier island off Perdido Key, Florida and was having a hard time figuring out how far off shore it is. I wanted to compare it to kayaking from the house I lived in on Kaneohe Bay (on Lihikai down by the fish pond) to Kipapa Island, which I used to do as often as possible with my then husband and then 2 year old son. As it turns out, the second offering from Google was a link to your story about kitesurfing. After reading that, I saw the link to this story and was delighted when I saw the beautiful salmon colored walls of Yoga Hawaii, where I did my yoga teacher training in 2005. So thanks for the stories, it was a nice break from work. I enjoyed reading about my old stomping/paddling/snorkeling grounds. Makes me wonder if I could still find the little spot my husband and I dubbed “Turtle Reef”. I’d like to think I could still find my way there again one day when an abundance of time and money allow. Namaste, dude. Aloha.